Brownian movement: The movement of molecules, as seen with a microscope, proved to Albert Einstein the proof that was needed to confirm the presence of atoms and molecules. As previously discussed somewhat in the previous section, atoms and molecules make up matter. There are four states of matter. The Kinetic Molecular Theory states that molecules in the states of matter move. The word kinetic is derived from and defined as movement. This movement is simply small vibrations in solids because the molecules in solids are more tightly packed together than they are in liquids and gases. The most dramatic, most rapid random colliding movements of molecules occur in gases. The movement of molecules in matter changes and varies according to the variation in terms of temperatures and pressure. When the pressure is increased the movement of molecules in the substance will decrease because increases in terms of pressure hold the molecules in matter more tightly together; conversely, when the pressure is decreased, the movement of molecules in the substance will increase because decreases in terms of pressure allows the molecules in matter further away from each other. There is a negative correlation between pressure and the movement of molecules. In other words, the greater the pressure, the less movement of molecules and the lesser the pressure, the more movement of molecules in matter. As pressure increases, molecular movement decreases. As pressure decreases, movement increases. Similarly, when the temperature is increased the movement of molecules in the substance will increase because increases in temperature with heat breaks the bonds and physical forces that hold the molecules tightly together are broken; conversely, when the temperature is decreased the movement of molecules in the substance will decrease because decreases in temperature with the application of cold will hold the molecules more tightly together. There is a positive correlation between temperature and the movement of molecules. In other words, the greater the temperature, the greater the movement of molecules and the lesser the temperature, the lesser movement of molecules in matter. As temperature increases, molecular movement increases. As temperature decreases, molecular movement decreases. Brownian movement of molecules, or the Brownian motion of molecules, as seen with a microscope, proved to Albert Einstein the proof that was needed to confirm the presence of atoms and molecules. The phases of matter are typically displayed and explained visually with a diagram such as the one above. 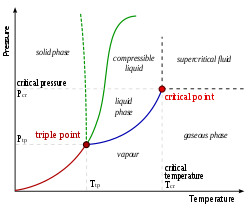 The triple point is the point of pressure and temperature at which the solid, liquid and gas states of a particular substance is in equilibrium and coexistence with each other. Boiling is the point at which a liquid transitions into a gas when the boiling point is reached; evaporation is the point where a liquid transitions into a gas when the boiling point is not reached; condensation is the transition from a vapor or gas back to a liquid; freezing is the transition of a liquid to a solid; and melting is transition of a solid into a liquid. As you can see, the transitions of states of matter move from solid to liquid to gas and from a gas to a liquid and then to a solid. Substances do not typically skip a step, except in some specific circumstances. These specific circumstances occur with the phase transition processes of sublimation and deposition which is also referred to as desublimation which is the opposite process of sublimation. Sublimation is the transition of a solid to a gas without going through the intermediate transition step of transforming into a liquid. Deposition, also referred to as desublimation, is the transition of a gas directly to the solid state without passing through, or transition to, the liquid state.